A little background: in Finland, the theatres are rather different from the standard Broadway/West End theatre. Instead of concentrating on one show at a time, Finnish theatres can have a dozen of plays in their repertoire at the same time. Theatres also usually have multiple stages, so same theatre can have many performances on the same night. I got a chance to take a little tour at Tampereen Työväen Teatteri, in the Finnish city of Tampere, so here's a peek into the backstage world of a Finnish theatre. Originally written for school. Tampereen Työväen Teatteri looks calm during the day. The lights are off, and the doors won't be opened for the public for many hours. Inside the theatre, however, things are looking busy. During the day, the upcoming productions are being transformed from imagination to reality. "It's impossible to learn these by heart!" Tampereen Työväen Teatteri, December 5th, 10AM. It has just been announced in the central radio that Carmen's [a drama version, not the opera] rehearsals will start in a minute. The actors gather around the main stage of the theatre. Chatting, leafing through the scripts, joking – I even hear someone worry about memorizing their lines. The play will premiere in February, and the whole theatre is preparing for it. Among other things. There are multiple productions under construction inside the theatre. soon be admired in Washington, D.C. While the actors are familiarising themselves with Carmen's dialogue, stagehands are moving big towers covered with plywood onstage. 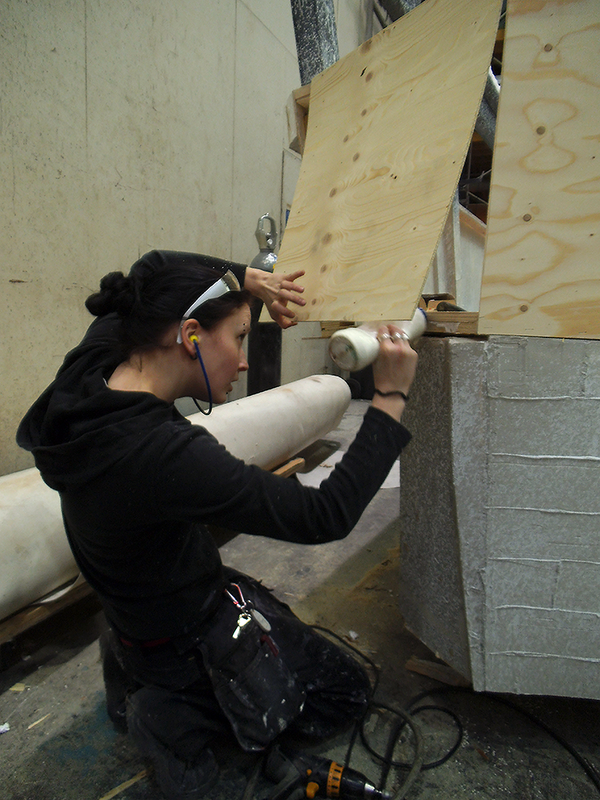 Besides Carmen, the theatre's set workshop, which is one of the largest of its kind in Finland, is working on several other upcoming pieces. One of them is a play called Lämminveriset. The play premiered two years ago, and it's been a while since the last performance in TTT, too. However, the piece is now changing continents: it will be performed in Washington, D.C., as a part of the Nordic Cool festival, next year. Marianne Rautiainen, who works in the set workshop, curses the size of the Lämminveriset sets. Kennedy Center in Washington, D.C. has a smaller stage than TTT, so the sets have to be changed to fit. First, the plan was to send five containers of sets to the US. Now the number has been reduced to three. However, there's still work to do, both with the sets that are going abroad and the ones that are staying in Tampere. All sets begin as small scale models. The set designer plans the model, based on the script and discussions with the director. Then the set workshop's carpenters, metal workers and surface finishing workers will build full-scale versions of the elements in the model. 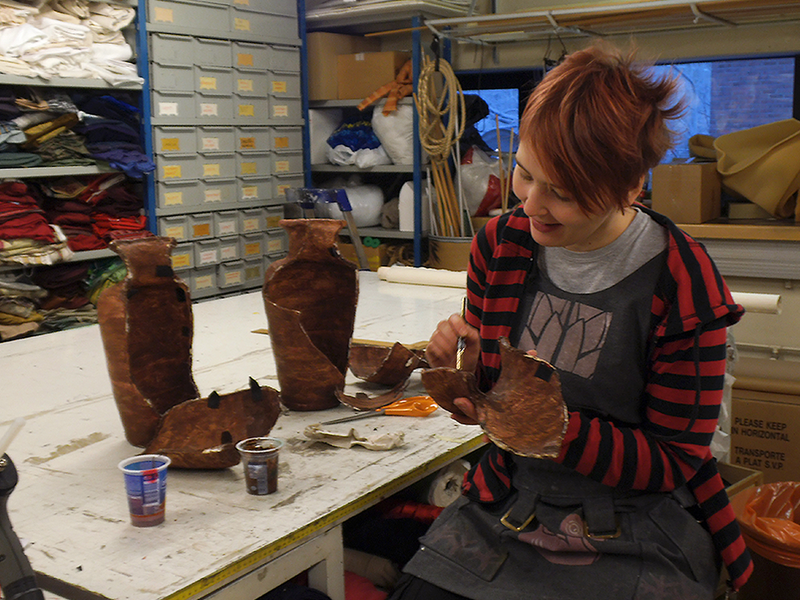 Tiina Vanhapelto working on a jug made to be broken. "A well-done set helps the actor to act and the audience to see", says set designer Hannu Lindholm, who has been working in the profession for 45 years. "You have to learn to apply your skills to new situations", Tiina Vanhapelto, a substitute worker in the props workshop, says about her job. The prop workshop can be asked to do just everything, from sails for a boat to taxidermy animal heads. The workers need a vast knowledge of arts and crafts. her Heli Tapper, Päivi Hatanpää ja Sini Paronen. Carmen's rehearsals keep going on the big scene. They're working on a scene for three actors, so one of the artists waiting for their turn takes the chance to visit the costume workshop for a fitting. Looks are an important part of all characters, and in TTT, it's of course professionals who take care of them. Like sets, costumes are based on a draft. Instead of a scale model, though, the costume designer draws a picture of their vision. 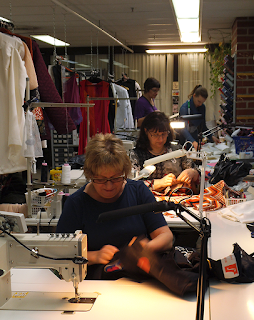 The costume workshop, then, creates the costumes based on the sketches. The style and the materials of the finished costume reflect the original drawing. The workshop also adds little theatre tricks to the clothing: they sew different pieces of clothing together and add hidden zippers, so the costumes can be changed in seconds during the show. A character's hair has to look right, too. For that task, the theatre has its own hair salon, where the hairdos and wigs are born. During the day, the salon takes care of the hairdos of the actors who use their own hair onstage. Hair is a part of the character's design, just like costumes, even when it's the actor's own instead of a wig. "An actor can't always decide whether they look good or not", actor Heidi Kiviharju says. Emmi Lahtinen (in front) and Tiina Ryynänen take care of actors' hair. In salon chairs, Heidi Kiviharju and Teija Auvinen. There can be up to three performances on the same night on different stages at TTT. So, the evenings can be quite a hassle. Therefore, the hair and make-up salon only helps with the most complicated hairdos and masks during the performances. Before the show and during it the actors mostly take care of their own looks. "Dear lord, I felt so frightened!" One of the high plywood-covered towers used for Carmen's rehearsals has just almost toppled over. The next time, the stagehands keep the tower standing – but unfortunately, it starts moving downstage too late. Luckily, there's still time before the premiere. In February, the lines will be memorized, and it's not too likely the sets will topple over in front of a live audience. When I leave the theatre, winter sun is shining, but the windows of TTT's foyer stay dark. The audience won't arrive in hours. Inside, however, the preparations for the night's performances and the upcoming productions continue on full speed.